People flip over puppies, but to me, a well-loved older dog is one of the most beautiful creatures on earth. An older dog has a nobleness about him, a look in his eyes that speaks of years of the special love that only a pet can give — trusting, nonjudgmental and unwaveringly true. Your dog's health is not entirely in your control, but you can have a real impact on his attitude. Your dog doesn't realize that he's getting older. His gray hairs don't cause concern and he doesn't worry about the other visible effects of time — the thickening of his body, the thinning of his limbs. He doesn't count the number of times he can fetch a ball before tiring and compare that to his performance when he was a young dog in his prime. He isn't worried about his hairline. A dog lives in the now. He doesn't reflect on his past; he can't imagine his future. Your dog takes his cues from you. When you're upbeat, encouraging and loving, he'll be at his best. As your dog ages, increase the frequency and diminish the intensity of his exercise. Instead of taking your dog to the park once a week to chase tennis balls until he's exhausted, take him for a long walk daily. 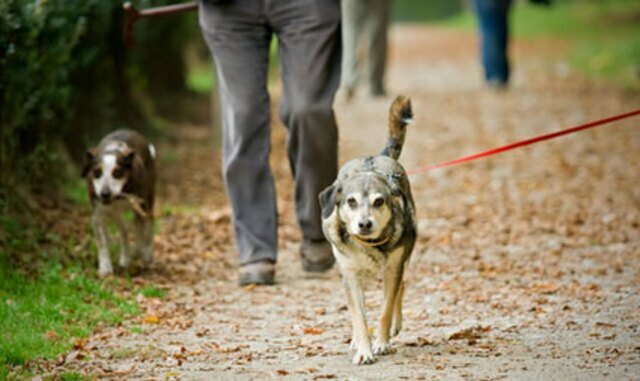 If your dog is having problems with physical activity, talk to your veterinarian. Medication may help keep him comfortable. And for some dogs, supplements such as glucosamine and omega-3 oils or complementary treatments such as acupuncture are another avenue. Your veterinarian can prescribe medications that may address the confusion and anxiety some old dogs experience. Give his bedding an upgrade. Think soft. Think cushioned. Think low. Your dog will thank you for these types of small creature comforts. Check out the sweater selection at your local pet supply store. Older dogs, like older people, sometimes have a more difficult time maintaining their body temperature. This problem is even more pronounced in slender, short-coated breeds like the Greyhound or Whippet or in tiny dogs. If your dogs are allowed on the couch, consider buying or building steps. You don't want to ruin TV time, right? A permanent ramp going down the back-porch step or a collapsible one to help your dog into the car will also be appreciated as he loses some of his jump. Don't forget to make an appointment for a senior dog checkup. Many veterinarians like to see senior dogs at least twice a year -- more frequently if an existing problem is already being treated and/or monitored. Your veterinarian may recommend diagnostic tests — typically blood work and an X-ray — in addition to a physical examination to spot problems early or to establish a baseline of health. You should discuss having your dog's teeth treated and cleaned, because gum infections and mouth pain will affect his comfort and health. The senior dog checkup is also a great time to determine if his diet will need to change to relieve excess weight from his joints. Arthritis can also be an issue, so it's important to catch joint and bone problems before they stop him in his tracks. Striking early, before these issues arise, helps keep older dogs healthy and fit, so your senior can enjoy his golden years.